Far superior thermal properties than brick or timber framed homes. All our Residential Building Log Walls which are exposed to the exterior of the building are designed through the application of internal insulation to achieve a U Value of 0.29 or better which exceeds the minimum requirement under Scottish Building Regulations which requires residential buildings to achieve a minimum U Value of 0.3. In the event of a fire a log cabin will not burn like a timber frame house, but will in fact only char due to the sheer mass of the logs themselves. This is an obvious safety feature which has a huge advantage over timber framed houses. All timber used in our builds have been treated with a totally natural flame retardant (Boron) which is also a natural anti fungal and insecticide. This treatment has been used by Log Builders for centuries as the traditional treatment and timber preserver of log structures. In the absence of Boron traditional Log Builder in Scandinavia and Russia used an alternative that also has the same properties which is Sea Water. On small dimensional milled timber kits, should a crack appear in the timber then there is a extremely high probability that the crack will travel the whole way through the timber, especially in the UK climate and the timber was kiln dried. A crack in timber will always head for the heart of the timber where it will travel no further, and as milled timber does not contain the heart, cracks will inevitably travel the whole way through. As all our builds are from green (freshly felled) solid log which contain the heart of the log, any cracks that do occur can never travel the whole way through the log as the heart prevents it from traveling any further. In addition to this, we also put a special cut in the timber which promotes all cracking (checks) to occur in one place out of sight. It should also be noted that when timber is kiln dried it loses over 40% of its strength, whereas green and air dried timber retain their strength characteristics as they dry out. Kiln drying also forces natural flame retardant salts within the wood to migrate to the surface and dissipate and thereby create a more flammable material. We only build with green timber which air dry over a period of around 2 years, this allows the timber to retain its strength and any natural flame retardant salts or introduced flame retardants to remain in the wood. Borates have been used as a wood preserver for centuries by man. They are recognised by the BRE (Building Research Establishment, UK) as accepted flame retardants. We apply them to green timber as the moisture level in the tree acts as the transport to carry the borates deep into the timber. This method of treatment cannot be used on kiln dried timber as the moisture content within the timber is insufficient to transport the borates into the timber. Once the timber has air dried, our oil treatments which contain borates are applied further to reinforce the borate level within the timber thereby maintaining the flame retardancy and preservation characteristics of the timber preservatives. The oils also reduce the events of checking (cracking of the logs) whilst acting as a water repellant. Our cabins are not like the thin walled imported kits that are currently available on the UK market, and which have an average life span of 10 years if not maintained, or 25 if maintained. Our cabins, if constructed and maintained correctly can last in excess of 150 years or more, so they are also an excellent investment. There are many examples of solid log cabins in Scandinavia, Eastern Europe, America, Canada and Alaska that are 300 years old and more, which is older than some of our castles in the UK. The oldest Log Cabin in the World is in Norway and is over 900 years old. Log Cabins help fight Global Warming, as the dangerous carbons that go toward causing global warming are trapped within the cells of the trees that the cabin is built from, and as minimum of processing is carried out on the tree, these carbons remain trapped in the mass of the log. Every time timber is cut, it not only releases these carbons into the atmosphere, every cut at a sawmill requires energy. So building with logs makes sense when considering helping to reduce carbons in the air and conserve energy. An average sized Log Cabin uses less trees than a same sized timber framed house, and this is due to the reduced amount of trees required through processing to produce the buildings, this in turn contributes to reducing carbon emissions produced through manufacturing processes involved in producing other types of construction and materials. And again the energy saved by using logs rather than milled timber is quite substantial per construction. Trees are a renewable resource, natural and an environmentally friendly building material. Log Cabins will blend in with any environment due to being built from a totally natural material. All our cabins are built using 100% natural materials with the minimum of processing. Log Cabins and Homes are a low cost way of achieving a far superior building over a timber framed cabin or home. 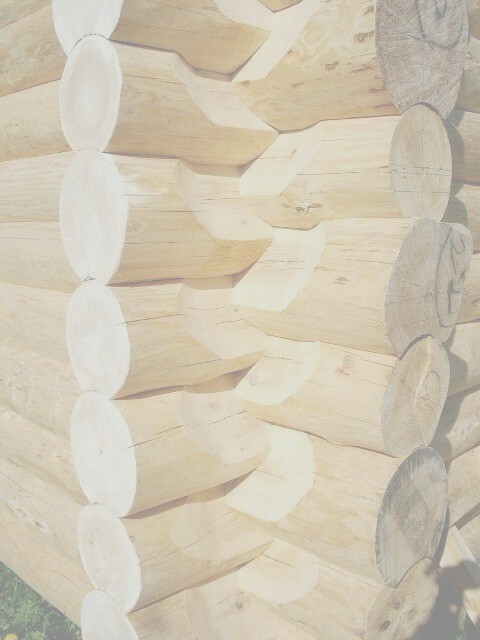 Log Cabins and Log Homes are esthetically pleasing to the eye, and have a natural tendency to relax a person living inside, in a way similar to certain colours affect ones mood. Research in America has shown that people living in Log Cabins and Log Homes achieve a much higher sense of well being and feeling healthy. This is one of the natural effects of wood on humans. There is no limit to the size of cabin or home, as the logs can be easily jointed for larger buildings. Log Cabins and Homes are extremely energy efficient and result in significant savings in costs when it comes to keeping them warm. This is due to the natural structure of wood whereby the cells of the wood act as small pockets of air which retain store warmth during warm periods, and then emit the stored warmth during cold periods. You will find your cabin warm in winter and cool in the summer and your heating bills will be greatly reduced as less energy is required to heat them and keep them warm. The logs in effect act as storage heaters with regards to heat energy. The lower energy demands contribute to helping reducing carbon emissions. It should also be noted that certain species of Scottish trees are faster growing than some of their Scandinavian and Eastern European counterparts. These faster growing trees have a huge benefit over their Scandinavian and Eastern European counterparts as their cell structures are much larger and therefore make them far superior in energy efficiency and the ability to store heat energy. The slower growing softwoods are normally much denser and have a lower U Value than the faster growing trees and are subsequently less energy efficient. We can build a Log Cabin or Log Home at a far cheaper price than a conventional Timber Frame Cabin or Home of the same size and specification. We offer a choice of complete cabin Shell or Part shell, subject to your budget and requirements. Our Log Cabins and Log Homes do not include foundations, plumbing or electrics. We guarantee our cabins for a minimum of 25 years against faulty workmanship. However, it should be noted that as the timber dries it may crack, but this is a totally natural process and is not classed as a fault. The cracks themselves will not travel all the way through the log, but will stop at the heart of the log (if the crack manages to travel that far), but using special techniques when constructing, we minimize this cracking (checking) and encourage it to occur where it is out of sight. However, these cracks will also add character to the Cabin or Home. The reason that the cracks will never travel through the whole of the Log is that unlike the imported small dimensional milled timber kits all our Logs still have the Heart of the wood in them, this prevents the any cracks traveling any further through the timber. Natural cracks that do occur have no effect on the structural integrity of the building in any way. If a crack appears in the timber of a small dimensional milled timber kit, then the probability is that it will travel the whole way through the timber, and this will mean expensive repair work to replace the timber. Building with green logs means that for the up to 2 years after completion, your cabin will shrink and settle while the timber dries out. This is normal and taken into consideration when building with allowances made for this when installing door openings, window openings, roof and internal stairs (if fitted). You can expect your cabin or home to lose about 1 to 2 ½ inches of its original height during this process until the timber moisture content has stabilized in harmony with the climate that it is sited in. With this in mind, all windows, doors and internal stairs are specially fitted to take this into account and allow for the shrinkage to occur. The fitting of the Windows, Doors and stairs is not a job for a normal Glazing Company as this is very specialised work that should only be carried out by trained and qualified Log Builders. Using green timber has the added advantage of all joints shrinking to an even stronger air tight fit as the logs dry out. However, because we use green log, the cabins will dry out to a stage where they stabilize with the environment and climate that they are built in, this is a huge advantage over kiln dried timber as this allows the timber to resist cracking and will allow it to breath naturally in a climate that it is used to rather than absorb water like kiln dried timber would do, and absorbing water would cause the timber to swell, cause joints to move and lose their sealing properties, and will also promote excessive cracking in the kiln dried timber and further promote rot within the timber itself. Water is the main enemy of wooden structures, and therefore maintenance is an important factor. Our customers are all informed of the routine maintenance required for a log building, which is not only low cost, but quick and easy to carry out. Kiln dried timber also consumes a vast amount of energy to dry the timber, so again by using green timber logs to construct with we are helping reduce carbon emissions and save energy at the same time. The cabins are constructed in such a way so that if sometime in the future you wished to relocate, you could in fact disassemble you log cabin or home and take it with you. This would be a great advantage if you were intending to move to a piece of ground that is undeveloped on, and your home would accompany you. This allows you a greater choice of locations to buy with a minimum cost involved. The 2 main factors that can damage a log cabin or log home is poor foundations or water damage. These are the most important factors we take into account when designing and building your log cabin or log home, so you can rest assured that they have been built to the highest specification and in accordance with International Log Building Standards. We offer an aftercare service whereby we would attend your property for maintenance of the timber to ensure that the water repellant (we only use traditional totally natural oil treatments which contain flame retardants, or we can also offer the cheaper water based acrylic finish which also contains flame retardants and is non-toxic and environmentally friendly) are still working as they should, and if they are not, then we would re-treat the timber. We only use qualified experienced Log Builders in our constructions. Less waste is produced through processing when building a Log Cabin or Log House. Our Log Cabins and Log Homes are a long term investment rather than the short term luxury purchase involved in an imported kit log cabin. Log Cabins and Log Homes cost far less to heat, and therefore more energy efficient than conventional timber framed houses. The internal walls do not require cladding or further insulation due to the thickness of log that we use in building. You therefore have a true log cabin, with log on the outside and log on the inside. Log Cabins and Log Homes are used in the Arctic Circle in Norway, Finland, Russia, and in Alaska as traditional residential properties without additional insulation, and these use less energy to heat and keep warm than residential homes here in the UK. All Permanent Residence walls with an external face are insulated internally to achieve a U Value of 0.2 as standard. Building Regulations for Scotland, which are some of the strictest regulations in the UK require the U Value for walls with an external face to have a U Value of 0.3 as a minimum. Alternatively should you wish to have the round log appearance on external facing log walls you could opt for Offsetting, whereby the roof and floor are super insulated to over achieve on the required U Values and thus allowing the U Value requirement for the walls to fall below that required for the component and this in turn allows you to maximize the thermal mass effect of logs whilst retaining the round log effect on the inner face of exterior facing walls. Internal walls are solid log installed during construction. You can have a Log Cabin or Log Home of your own design, and we would be happy to assist you in this with advice and expertise so that your final design plan meets your requirements. We build with Norwegian Spruce, Larch, Douglas Fir, Sitka Spruce, Lodgepole Pine and other conifers, so your choice of woods and the variations of the natural colours of the logs allow you a wide choice, however, based on the use and location of the cabin we would advise which species would be more suitable for you, although this would not limit you to that species. In summary, Log Cabins and Homes are built from natural renewable resources. Energy efficient, Low Cost to build, Low cost to maintain, environmentally friendly, produce less waste during being processed and built, assembled using only natural materials all of which contribute toward lowering carbon emissions and subsequently aid in the fight against global warming, On top of that, a Log Cabin or Log Home will blend in with any environment that it is sited, be it city, town, village, countryside or forest. What more could you ask for, and top of all that, you would be helping toward reducing carbon emissions and saving energy and cost, both at a personal and global level.